There’s nothing quite like being near the beach to discover creative inspiration. With the calming Pacific Ocean waves rolling in and the beautiful sun shining down, Santa Monica is the perfect place to unleash your imagination. Here are some spots to put your artistry and vision to work including jewelry making classes, pottery classes and more. Even if you’re not good with your hands, there are other ways to inspire creativity in Santa Monica. 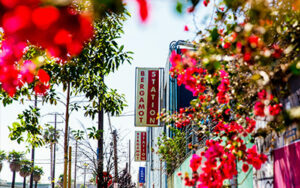 One great option is to gallery hop at Bergamot Station. This amazing complex at 2525 Michigan Avenue was once a railroad station and is now one of Southern California’s largest art complexes and cultural centers, featuring a theater and over 40 art galleries, featuring a wide range of art from photography to paintings to sculptures. And the absolute best part? It’s all free! 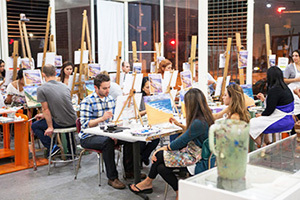 Come to Bergamot Station and get inspired to create your own masterpieces. Ever been curious to try your hand at pottery? Well, at The Clayhouse on Santa Monica and Yale, you can! This ceramics studio hosts classes for everyone from beginners to pros. Once you visit, odds are you’ll get hooked since working on the pottery wheel can get pretty addictive (and it’s a great way to build your collection of dishware and vases!). The Clayhouse is a communal ceramics and pottery studio that has been operating in the same location in Santa Monica since 1971. They offer clay, tools, glazes and kilns (in addition to the throwing wheels), along with professional staff to help inspire your most creative pottery pieces. Who needs Tiffany & Co. when you can make your own jewelry at Precious Metal Arts? With jewelry making classes and workshops that include metalsmithing, stone setting, and jewelry design, you can learn everything there is to know about jewelry making at this studio. These classes are designed for students of every level to join. Even if you’re not looking to make your own accessories, you can still visit 2510 Main Street to shop for rings, necklaces, and other baubles, or get your own jewelry repaired. It doesn’t matter if you’re a budding Bob Ross or your painting skills are lacking; is great for artists of all levels. Guests can walk in and paint a canvas of their liking, or take one of the many classes the studio offers for adults, teens, and kids. PAINT:LAB also features special events, like Brushes and Bites, where you get to paint while you eat and hang out with fellow artists. PAINT:LAB provides all art materials and canvases for purchase to help get your creative juices flowing. Use the studio space for uninstructed painting or sign up for a class. So, hit up 1453 14th Street and create some art to take home! While the weather is often beautiful during the day, temperatures can drop at the beach as the sun slips beneath the horizon. What better way to stay warm than by learning how to knit your own hat, mittens, and blankets at Wildfiber Studio? Located at 14th and Broadway, you can take classes to learn all there is to know about knitting. There’s even a social group that meets every Thursday from 6pm-8pm, where you can sit around eating and gabbing while knitting, crocheting, and creating other fun design-like arts and crafts! If you’re already a knitting enthusiast, Wildfiber is the perfect place to get all your yarns and other knitting needs.